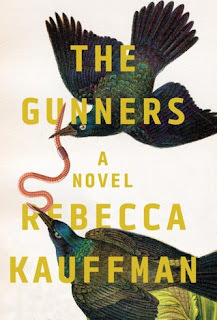 The Gunners by Rebecca Kauffman is a very highly recommended story of a group of long-time friends and their connection to each other. Mikey Callahan is a thirty-one year old man facing a future of blindness from early-onset macular degeneration. Mikey has always struggled with establishing connections with other people, except for the group of friends he met years ago, when he was five and they were all six. Sally, Alice, Sam, Lynn, Jimmy, and Mikey became friends as children when they were all living in a run-down area of Lackawanna, a suburb of Buffalo, N.Y. The group of kids hung out together in an abandoned house that had the name "Gunner" on the mailbox. The group took over the decrepit house as their clubhouse and the name Gunner for their group. Sally was Mikey's first friend, and he, as well as the others, never knew why Sally, suddenly and inexplicably, stopped talking to all of them, cutting off her friendship and reducing the group to five. After high school the group spread out, with the exception of Mikey and Sally. Mikey still lived in the area, as did Sally, but the two never spoke. Mikey, however, has reconnected with the others, exchanging news mainly through email. Now, Sally has committed suicide and the group is going to attend her funeral and reunite. Reminiscent of The Big Chill, the group comes together to say goodbye to Sally and reestablish the connects that they share. Obviously, The Gunners does head down that well-traveled literary and film tradition of old friends reuniting after years apart. Kauffman handles this premise with skill and insight into her individual characters, always presenting them as individuals. They also all have secrets they have harbored over the years that have been left unspoken from their teen years. They all have a secret that they believe was the root cause for Sally to stop speaking to the group. Mikey is clearly the most sympathetic and well-developed character of the group, but Alice, Lynn, Sam, and Jimmy are presented as distinct individuals with their own memories and secrets. The bond the group share, even though they have went their separate ways since high school, is obvious and clearly shown through flashbacks in the narrative. This is an excellent novel, insightful, with admirable prose and a keen insight into emotions, friendship, and forgiveness. Kauffman explores interpersonal and family relationships, and the strain secrets can inflict on these relationships in this layered examination and coming-of-age story. While not a startling novel with a shocking reveal, this is a beautifully satisfying novel - rich in details and emotions - that reaches a more than satisfying conclusion.